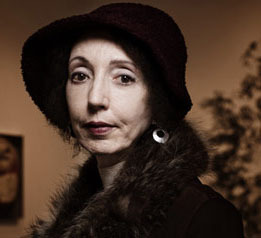 The eight stories which form the new collection “High Crime Area” from Joyce Carol Oates are daring and provocative. She creates a wide range of vividly-written memorable characters including a pot-smoking widow, an arrogant famous author, a terrifyingly vicious nun, a neglected bi-racial baby, a mysterious dishevelled bookseller, a love-hungry subway passenger and a civic-minded dropout student. By creating tense and emotional tales about these individuals’ lives the author touches upon deep fears which run through American society. The depictions of heightened emotion and sensational violence are dramatic visions of our culture’s broader underlying feelings. Looming behind the particulars of these isolated struggles are institutions such as prisons, churches, orphanages and universities whose ideologies reverberate through the consciousness of the characters and create conflicts in each story. Racial tension, drug abuse, gambling addiction, sexual violence and floundering education are particular issues which run through multiple stories. It’s an admirable skill when short stories can present both micro and macro pictures of society in such a condensed amount of space. This allows a wider vision of the world to unfold out in the reader’s imagination. In ‘The Home at CraigMillnar’ a formidable nun is found dead in her bed by an orderly who works for the elderly care facility. Her face is covered in a mysterious thin shroud. Many of the women at this home are former sisters who still attend mass and I was particularly struck by a creepy description of how “the old women’s tongues lapped eagerly at the little white wafer.” The orderly narrates the story giving an account of his experience of caring for the cantankerous woman before her death and the controversy surrounding her time administering a home for orphaned children. A sense of deep mourning fills the story ‘High’ where late in life a woman named Agnes takes up drugs for the first time and lets her niece and her friends ransack her house. This seems to be a resigned reaction to what is perceived to be a futile existence that carries on regardless. “I am a widow, my heart has been broken. But I am still alive.” Agnes finds herself longing to re-establish a connection with a prison inmate she tutored and who she made an impact upon as if this slighted man could give meaning to her drifting life. The very short story ‘Toad-Baby’ is a haunting family snap-shot narrated by a girl whose unbalanced single mother unleashes a torrent of abuse. The mixed race of the girl’s very young step brother is transformed into a mark of disgust by the mother and daughter. Witnessing the baby’s pain is something which permanently imprints itself upon the girl’s consciousness. The short, darkly hallucinatory story 'Demon' appeared in another version in an earlier very short collection by Oates published in 1996. This new version has some slight changes: he's given the name Jethro, he's 19 instead of 26, there are more details about the boy's parents and, most striking of all, an extended scene is added in a bus station public lavatory which is referred to only briefly in the first version. In this location he still experiences a crisis of the self confronting his image in the mirror (the denial of the self which he attempted to suppress with prayer made unavoidably clear in the eyes staring back at him in the dirty mirror), but he also has a violent sexual encounter with a minister which is interrupted by someone who enters the lavatory. Part of his subsequent scorn by those around him is tinged with homophobia. In this new version its made more explicit that physical signs which demarcate him as other or “cursed” and “demon-like” (the prominent birth mark, red hair, stunted-growth) as well as social stigmas which have been attached to him are differences used as excuses by external social forces to ostracise and demonise him. Because, of course, there is nothing essentially evil about him or anyone; there are only the strictures people impose upon each other borne out of their own fear and dogmatic principles. Tellingly in this new version his physical reaction to a shocking attempt to rid himself of what he's come to believe is an inherent demon-curse has changed. What was described as resulting in “no pain” in the first version is now a “pain so colossal it could not be measured – like the sky.” This doesn't so accurately describe the physical sensation of his misguidedly destructive self-ameliorating act, but reflects the pain which results from continuous self-punishment for not living up to the idealized standards we create for ourselves and that are formed out of social pressures to conform. The story prompts us to question why we do this to ourselves. Tragically Jethro’s act represents a definitive decision to never look at his true self again. In the story ‘Lorelei’ a provocatively dressed young woman rides the subway in search of a specific unknown and unnamed “you” or someone to love her. The claustrophobic environment of the train carriages with their jostling passengers all making mental judgments upon each other and guarding their own personal space is vividly and accurately described. Like a darker “glossy black” haired mirror version of Marilyn Monroe’s character from ‘Gentlemen Prefer Blondes’, Lorelei flirts and yearns so fiercely to find that special one and aches with such yearning for someone to complete her. It’s a quest destined to destroy her. One of the stories which particularly moved me is the complex sombre story ‘The Rescuer.’ Here a young university student named Lydia is called upon by her parents to visit her troubled brother Harvy. Once he was a promising pupil at a seminary school, but dropped out and moved to a dilapidated apartment in a depressed neighbourhood of Trenton, New Jersey. At first she is reluctant to take on the responsibility of visiting him, but once she’s there her life becomes irretrievably intertwined with his own. The siblings retreat from the institutions for higher learning that supported them and instead turn inward, Harvy working on intensely-laboured poetry and Lydia on unpicking the meaning and possible translations of ancient text about infanticide. Because of her brother’s drug and gambling habits their lives become entangled with an intimidating local man named Leander with a Maori facial tattoo and long dreadlocks and his mischievous sister who has a penchant for going to casinos. Lydia is seduced by the prospect of abandoning the torturous mental effort of her studies: “I thought how easy life is for those who merely live it without hoping to understand it; without hoping to ‘decode,’ classify and analyze it; without hoping to acquire a quasi-invulnerable meta-life which is the life of the mind and not the triumphant life of the body” The story presents a kind of crisis about the real value of an intellectual life and how the quest for knowledge can be rendered meaningless in the ruthless decimation of the weak over the strong in the human species’ quest for survival. “Individuals die, life endures. A copy of a text is destroyed but another takes its place – just like us.” Writers and scholars scribble away in faith that their contribution will provide a further piece to assist in the evolution of humanity. The story asks what happens if that faith peters out. Even without it the narrator finds that “working diligently and even obsessively without faith did not seem to me a terrible fate, when the alternative was yet more terrible.” Although the brother and sister’s preoccupations are wholly their own they find the compulsion to articulate meaning (even if it doesn’t contribute to a greater whole) is better than a life of total resignation. In ‘The Last Man of Letters’ an extremely famous male author only referred to as X goes on a European book tour. He takes perverse pleasure in humiliating the women who praise him and his work. His perpetually macho antagonistic stance goes unchallenged due to his awestruck admirers’ reverence for a man that has been bombastically proclaimed to be the “last man of letters.” Parades of anonymous unnamed women populate his imagination and marital bed, so many that “the effort of trying to make sense of it exhausted him, and disgusted him.” As an asthmatic he sometimes chokes for breath with the sense that he’s fighting for his life. The vile hatred he spews at the women around him is like the chilling sound of a man gasping for air. In what might be an oxygen-starved hallucination the women he’s shamed visit him in his hotel room. A breathlessly narrated scene of orgiastic excess ensues where X is plied with rich food and eager flesh by the rapacious ladies which results in a judiciously horrific conclusion. A young white teacher who moves to Detroit asks herself “Why am I so preoccupied with racial identities, skin ‘colours’?” It’s the Spring before the Detroit riots of 1967 and this woman, Mz Mc’tyre, senses the mounting racial tension in the collection’s title story ‘High Crime Area.’ She’s witnessed the dwindling white population moving from the city into the suburbs and has a mounting fear of being attacked which escalates after reading a paper from a female student about her imprisoned cousin who has converted to “Black Islam” and expresses extremist ideas. While walking to her car she senses a man following her. She has a gun concealed in her bag. The story is incredibly suspenseful and the conclusion is utterly surprising. The book “High Crime Area” is a seductive read with its entrancing array of voices and innovative forms of narrative. The stories draw us into danger to provide a thrilling read which challenges our assumptions.